Roberta Flack, Anne Murray, Sting, Bryan Ferry and Clifford T. Ward, among others, all have one thing in common and that was, prior to becoming famous musicians, they were all school teachers. That latter had a cult following especially after his 1973 single Gaye made the top 10. 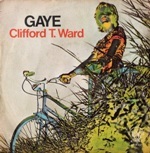 Clifford T. (which stands for Thomas in case you were wondering) Ward was born in Kidderminster in Worcestershire and became a teacher in Bromsgrove. His effeminate looks and straggly long hair made him hard to pigeon-hole but he was well-received whether it be on Top Of the Pops or in Jackie magazine. It was whilst growing up listening to Radio Luxembourg that he became interested in pop music and in 1962 formed his first band, Cliff Ward and The Cruisers which became a big attraction in the Birmingham area. They didn’t release any material and after a couple of years disbanded. In 1965 he’d joined a local soul covers band called the Secrets. They managed to sign a deal with EMI Records and released one single which was credited to Martin Raynor and The Secrets even though there was no member with that name! Within a year they moved to CBS records and released three singles under the name Simon’s Secrets even though, once again, there was no one with that name. In 1969 the Secrets split and Clifford, with a little help from Jimmy Page, signed as a solo artist to Andrew Loog-Oldham’s Immediate label but it didn’t last long as the label folded the following year. In his spare time he’d been studying to be a teacher and in 1972 began at North Bromsgrove High School teaching English and Drama. One of his pupils was the future actress Trudie Styler who went on to marry another former school teacher, Sting. The same year one of his demo tapes was sent to John Peel who was a co-owner of Dandelion Records with Clive Selwood. John recommended Clifford to Clive and was then duly signed with Clive also becoming Clifford’s manager. But the label ran into trouble too, “I was recording my Home Thoughts album,” he told my friend and co-author on the 1000 Number Ones book, Spencer Leigh, “When one night Clive came in and said that Dandelion would have to end as a company because they were short of finances, but he liked the songs I was writing and he would take them to various record companies. The first one was Charisma and one of the directors, Tony Stratton-Smith offered me a contract.” Charisma was home to Genesis, Monty Python and Lindisfarne. In 1984 he was diagnosed with Multiple Sclerosis and despite the frustration of his growing disability he continued to write and record at his home studio. He released his last album Julia and Other stories in 1994 and said to Spencer Leigh, “I’m like a bat, I function best at night, but I had to make some of it on all fours.” The same year when interviewed by the Wolverhampton Express & Star, he told reporter Aidan Goldstraw: “I have not and will not come to terms with this illness. There are times — usually quite late at night — when I’m almost normal again. But unless they find a cure for this dreadful MS, then I don’t see a future”. Clifford T Ward died of pneumonia on 18th December 2001.